The constitutional guarantee to free speech is in the news. On university campuses across the country protestors are lining up to do battle against university sponsored, or university-based group sponsored speakers. Does a speaker have the right to be heard no matter what he or she espouses? The following is a partial list (which I compiled by searching the internet for who has been prevented from speaking at universities) of people who have been “disinvited” to speak at universities, disrupted in their attempt to speak, or prevented from speaking by the threat of protest. 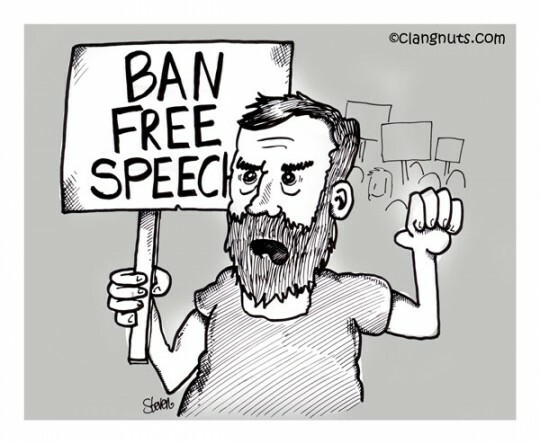 How much free speech do you want for free? No matter what your position on allowing offensive (and everyone in the list above is offensive to someone) speech at a university, or anywhere else, there are certain things about the First Amendment protection of free speech that should be remembered. You can, in most situations, express your opinion about almost anything, but by doing so you open yourself up to criticism. Criticism is also protected free speech. For example, if you don’t like what I write on this blog, you can, in the comments, dispute what I have written and tell me I’m wrong. Your comment is the consequence of my self-expression and you have the right to criticize me. (On the other hand, I also have the right to delete your comment if it violates my rules or I find it offensive. That’s the consequence of your speech in my comments. Click here to see commenting rules). 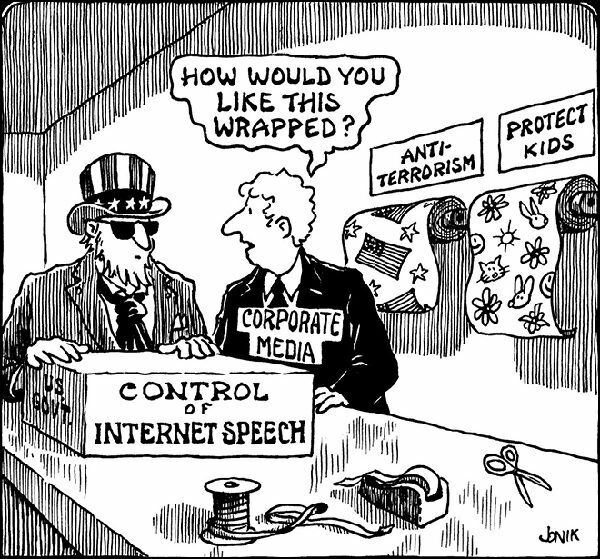 The government protects free speech. Private citizens or groups do not. If I own a venue and invite speakers to visit on occasion, I can choose who I want to invite. If I invite Bernie Sanders, but not Mitch McConnell, I have not limited the free speech of Senator McConnell. I simply haven’t invited him to my venue. He is free to find his own venue in which to speak. If I do invite Senator McConnell, and then change my mind, I might be considered an ill-mannered jerk, but I’m still within my rights, and I have still not restricted the Senator’s free speech. When UC-Berkeley decided to postpone Ann Coulter’s speech (Coulter herself is the one who chose to cancel), they didn’t restrict her free speech, even though you might consider them jerks for changing the date of the invitation. Ms. Coulter still has the option of writing books and op-eds, speaking at rallies, talking on television, radio and podcasts. In fact, she did just that in the article linked in this paragraph. She has every right to rail against those who prevented her from speaking. But she still has freedom of speech. When universities cancel speeches because of the threat of protest, they have the right to do so. This is not limiting the canceled speaker’s free speech. Every one of those speakers is free to find other locations to speak, or write their opinions, or find broadcasts on which to express themselves. We can disagree with a group or university who prevents or denies someone the opportunity to speak at a particular location, however, that someone still has the option of arguing against the denial on their own. 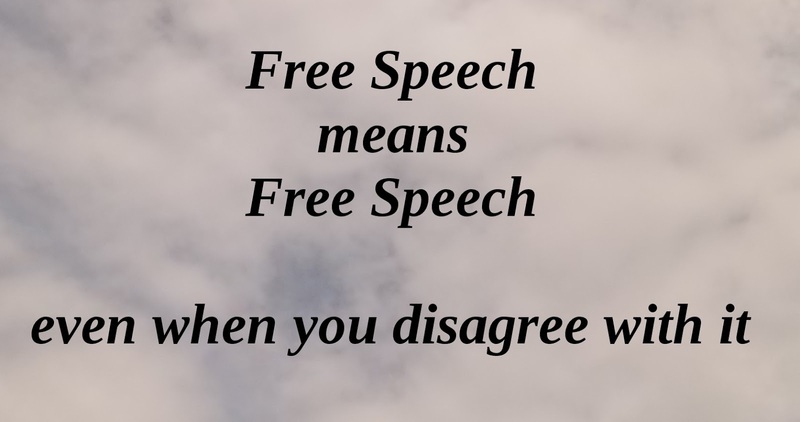 You do not have a right to free speech in a forum owned by someone else. They can kick you out. They don’t have to allow you to speak. It’s illegal to incite others to criminal acts or to riot. In Brandenburg v. Ohio the U.S. Supreme Court set the standard for what is permissible. This includes so-called “fighting words” which would also incite violence. 3. The following description is the basis of a settled suit against the defunct Trump University. You are not allowed to make false or fraudulent claims in the course of business. You are not guaranteed free speech in your workplace, except union organization, which is protected by law. 5. This applies to all students. Students have restricted rights to free speech in school. 6. Is “knock the crap out of them” a violent threat? You don’t have the right to threaten someone with violence. The American Civil Liberties Union states that objectionable speech may not be restricted at government-financed campuses. Academic freedom (and freedom of speech) protects the rights of a person who makes objectionable statements, but does it also protect the right of the governing body of an academic institution to change its mind? Once someone is invited is there no option but to let them speak? What about someone who is not invited? May they “invite” themselves? Furthermore, in the case of Ann Coulter, as in many other of the disinvited speakers’ cases, the university itself didn’t invite her. She was invited by the Berkeley College Republicans, a university supported, but private organization (Note: The Berkeley College Republicans are the people who also invited Milo Yiannopoulos, who was also “disinvited” by the university). That’s the wrong response, well-meaning or not. The First Amendment to the United States Constitution protects speech no matter how offensive its content. Speech codes adopted by government-financed state colleges and universities amount to government censorship, in violation of the Constitution. And the ACLU believes that all campuses should adhere to First Amendment principles because academic freedom is a bedrock of education in a free society. The American Library Association fights censorship every day…but are they against censoring everything? Should objectionable speech be allowed on public campuses? What’s the difference between objectionable speech and hate speech? Is name calling protected speech? What about name calling in the form of racial or ethnic slurs?